The third edition of The Masters was held in Milton Keynes from 31 January to 1st February. The first two editions were in Edinburgh, Scotland. There would be a new name on the cup. 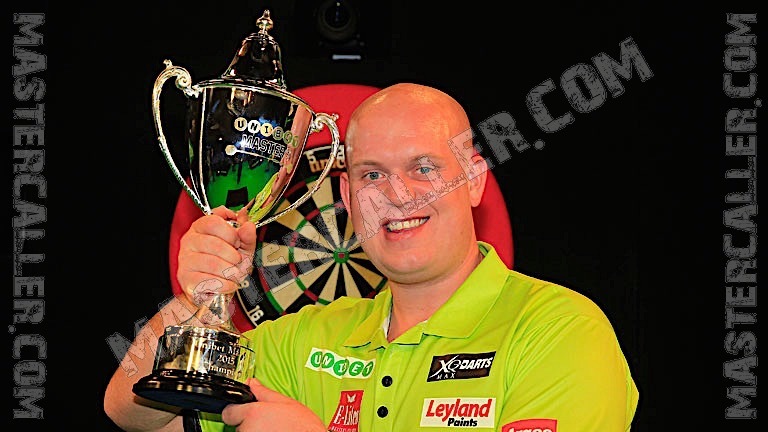 Michael van Gerwen defeated compatriot Raymond van Barneveld in a high-quality final 11-5. Van Gerwen played some wonderful matches with very high averages during the tournament. In the quarterfinals, he has an 110,29 average against a very strong Dave Chisnall, who despite 13 times 180 has let the victory with 10-9 to the Dutchman. In the semi-final Mighty Mike defeats Englishman Adrian Lewis 11-6 and in the final Raymond van Barneveld. An average of 112,49 and a record number of 14 maximumss make it a memorable Masters final. Raymond van Barneveld also plays a very strong tournament. As the number ten seed he defeats Simon Whitlock, Terry Jenkins and world champion Gary Anderson consecutively on his way to the final. It was the first defeat for Anderson after tournament victories at the Players Championship Finals and the World Championship.